It’s easy to see why rubber is the flooring of choice for many commercial, educational and government establishments – and even, in some cases, a good choice of flooring for areas of the home. It has outstanding durability, as well as resilience and is also resistant to burns, scratches, dents and stains, as well as being completely waterproof. Furthermore, it comes in a stunning array of colours and designs and can also incorporate textures for additional safety. Surprisingly, it can also be a very environmentally-friendly option too! Rubber flooring is used in a huge variety of settings, from airports to schools, hospitals to lifts, farms to restaurants, as its high durability and resistance to wear and tear means it can cope with just about anything, from dogs claws to stiletto heels! In many of these cases, particularly in areas of high traffic, it is worthwhile applying a maintenance layer of polish to the surface to make cleaning and maintenance of the rubber flooring easier. 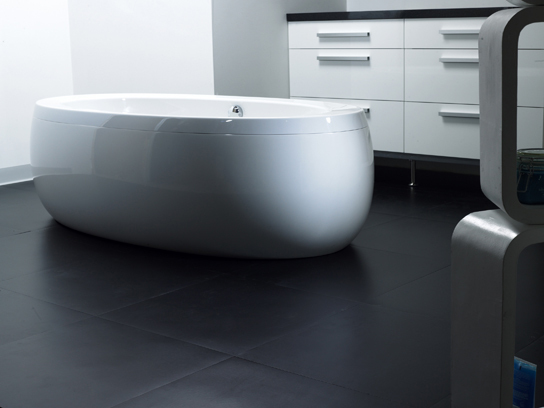 Rubber floors have also gained in popularity with modern designers as it gives a room a unique ‘high-tech’ look and feel, as well as being versatile enough to match a variety of design schemes. Modern rubber flooring comes in solid sheet or tile form and is available in wet suit finishes, primary and pastel colours and with embedded textures, such as studs or ribbing, for potentially wet areas to prevent slipping and accidents. Durable: most good quality rubber is guaranteed to last the life of the application without cracking, wearing or breaking. In fact, it is not unknown for the rubber floor to outlast the life of the premises in places such as airports, stations and public transport such as buses and trains. Their longevity is due to their high abrasion resistance and also to an in-built system of self-releasing wax which helps the rubber “heal” against scratches and abrasions. The other factor that helps their longevity is rubber’s inherent resilience and flexibility. Anti-Fatigue: one of the key benefits of rubber flooring is its cushioning effect which dissipates impact energy and thus reduces strain on joints and muscles. This then helps to provide comfort underfoot and prevent fatigue. This makes it an ideal flooring for situations where people will be standing for long periods, from the domestic kitchen to commercial settings such as factory conveyor belts, bars, shopping centres, cash registers and transit areas. This cushioning comes from rubber’s highly-elastic polymer chains arranged in a unique cross-linked network, which enables them to act like miniature springs beneath your feet and gives rubber some of its great resilience under heavy weights. I am giving you best variety of **foorings** and **mattings** just in our store, our products is rubber matting , rubber flooring, gym mats, gym flooring, rubber sheet, playground tiles and stable mats. These all products is non slip as you know this is now compulsory in organization and houses to secure, and we also give you rubber fooring and rubber matting in very best prices.